The topic of land in the Old Testament is said to be only secondary to that of God Himself. It is a complex topic and one I find myself delving into more deeply as an analogy of the marketplace as the means of human provision. Land, from the beginning of creation, has been the primary means of production. It is from the earth that we draw our livelihood as crops for consumption and materials for creating an unfathomable range of products and buildings. Walter Brueggeman, in his seminal text, The Land, creates a mental picture of the interconnectedness of Yahweh, the land, and God’s people. They are inextricably linked. But God provided for Israel even in their landlessness of the desert journey with meat (quail) and bread (manna) and water, all connected even to that barren land. Their clothes did not wear out and their health was maintained. We often hear phrases in the church like “taking back the land” as reclaiming something that has been taken from us. The sentiment seems to be that we must take charge of the situation and forcefully drive out those who have misappropriated that which was somehow “ours” (as the people of God). The land of Canaan was the land promised to Abraham. It represented provision and security, even prosperity, the actualization and fulfillment of the very shalom of God. This was by no means taken by the Hebrews to mean some future, spiritual heavenly status. This was temporal and at hand, in contrast to the slavery of Egypt and the un-settledness of the desert. This was a real promise in real life. As Joshua and the second desert generation entered the land, God went before them. They had only to march around Jericho, according to God’s command, and the walls tumbled to the ground. The city was taken without war or coercion or the loss of Israeli life or livelihood. The wealth of that great city, except for the foolishness of Achan (Joshua 7), was consecrated to God. The nation of Israel was walking into a promise that seemed even more unbelievable than the giving of the land. They were to have cities they did not build, houses already furnished, cisterns they did not dig, vineyards and olive trees they did not plant (Deuteronomy 6:10–11). Prosperity was being handed to them on a silver platter! The phrase “taking back the land” has a clear militancy to it. But as we have just seen, the Lord went before them and prepared the place for Israel (sound familiar?–John 14:2–3). Israel had to do little other than to walk in and take up residence. The Lord had promised that He would do the work of clearing the land (Exodus 23 and Deuteronomy 11:23). It seems reasonable that the Israelites had to war against the inhabitants only as they disregarded seeking God’s counsel and were deceived by the Gibeonites (Joshua 9), and they fell into disobedience, perhaps in following after the gods of the inhabitants. They lost the purity of their worship of Yahweh and possessing the land became strife laden. To receive the gift of the land of promise, Israel had only to seek after God with all their heart, mind, soul and strength. This is where I draw a strong analogy to Christians in the marketplace today. It is easy to see how the marketplace has been corrupted by sin. Our work, whatever our vocation, as worship or service to God (see ‘abad–Strong’s 5647), programmed into the DNA of being human at creation (Genesis 2:15), is a sacred calling and trust. But the land, as gift, should give us pause as to how we work and how we “take back” the marketplace for God. We tend to strategize and create actions plans, we control and manipulate, we scheme and execute . . . all by our striving and, perhaps, by some leading of the Spirit. Missiologists (those who study the mission of God, the misseo Dei, in the world) are just beginning to observe, catalog, and study God’s movements in the marketplace. In God’s grand scheme of the redemption of all creation, meta-institutions, like government and the marketplace, continue to undergo reformation. As marketplace Christians, “living into” our vocational callings by obedience, we demonstrate the glory of God in how we first rely on God for His provision amidst the dryness of our deserts and act wisely as he leads us into His promised land, where righteousness, as economic and social justice, will overcome the sinfulness of humankind even in the marketplace. The work that God gave to Adam, to cultivate and keep the Garden (Genesis 2:15), was without the toil, resistance, and sweat brought on by the sin of disobedience (Genesis 3:17–19). Jesus said, “Come to Me, all who are weary and heavy-laden, and I will give you rest. Take My yoke upon you, and learn from Me, for I am gentle and humble in heart; and you shall find rest for your souls. For My yoke is easy, and My load is light” (Matthew 11:28-30). Work is a key component in our daily lives. Our vocations can be fulfilling or troublesome. Hopefully this leads us to question our vocations, or how we are performing in them, if we find ourselves vexed at worked, despising our bosses or even the work itself. If we are “living into” God’s Kingdom, we will stop striving after our ambitions but seek only to please God in the marketplace. By pursuing righteousness, we will see the reward of His “Kingdom come on earth as it is in heaven” (Matthew 6:10), the shalom that passes all understanding (Philippians 4:7), even at work. The following essay, one of a series of word studies, is adapted from Eden’s Bridge (release pending, January, 2012). “Then the Lord God said, “It is not good for the man to be alone; I will make him a helper (`ezer) suitable for him.” The Triune God recognized the benefits of human community. Eve is designated as `ezer neged before being called wife (Genesis 2:22–24, ‘ishash, as the opposite of man and his mate). (i) This first reference says a great deal about God’s intention for the relationship. An `ezer is a helper, a partner, one who aids and helps protect. The modifier, neged (Strong’s 5048), is translated as suitable only in Genesis 2. Literally, it means in front of (before), conspicuous, in the presence of, or opposite (as in, facing). The opposite aspect may be most clear with Eve as Adam’s sexual counterpart. Wives share the joys and burdens of life with husbands and vice versa. God expresses concern that it was not good (towb, meaning beneficial—Strong’s 2896b) for Adam to be alone (bad, not bad as in evil—Strong’s 0905). The Hebrew word bad means solitary, separated. It is the term used several times in Exodus for the poles (staves) designed to carry the Ark of the Covenant, as they were individual branches separated (bad) from trees. Allegorically, the lifelessness of a cut branch is not dissimilar to the lonely man cut off from the benefits of being in community. Fellowship in common cause is vital to sustaining human life and increasing the ease with which life is made more tolerable and enjoyable. The deeply intimate social and co-creative aspects of the Trinity were endued to God’s human family in the male and female likeness. Elijah bemoaned his solitude (bad) in the lonely cave and feared for his life without the company of fellow believers (I Kings 19:9). In Hebrews 3:3, Christians are exhorted to come alongside one another daily to battle falling back into sin. The birth of the church occurred on the day of Pentecost as the 120 were gathered in the Upper Room, likely in deep fear, to encourage one another in light of the recent Crucifixion of Christ and their dismay as to the uncertainty of the future despite Jesus’ already revealed resurrection. Fellowship encourages us, whether in the home, at work, or at leisure with friends, and helps hold us accountable for ungodly behavior. The division of labor, and cooperation and collaboration in the marketplace enhance our quality of life. The marketplace is where the majority of our social interactions occur. The practice of worship, as trusting and obeying God, was not institutionalized in Genesis 1–2 before the Fall but was experienced in direct fellowship with God. Worship, like marriage and the marketplace, was established in the Garden and was contingent upon the appropriate, submitted relationship of Adam and Eve to God. The earliest form of worship was no more than walking in obedient fellowship with God. God’s intent for Adam and Eve to work, steward, and procreate (multiply—Genesis 1:28) imply the sacred nature of these activities. (ii) As created and ordered systems, marriage and family, along with business,(iii) were instituted simultaneously with the introduction of Eve as a suitable partner. The ‘ezer neged (suitable helper) facilitated productive partnership. That partnership promoted the expansion of the human family by procreation and of weal,(iv) as the quality of life was improved through increased efficiency making their work more productive. Worship, marriage (and by extension, family), and business are the original and intended institutions of God in creation. Similarly, theocratic governance, to maintain social order in communal living, is instituted as obedient response to God’s ownership (lordship) and the generous provision of the Garden in the single “rule” (to not eat of the Tree of the Knowledge of Good and Evil) of the pre-Fall Edenic covenant. i. On humankind created male and female, Genesis 1:27 uses the Hebrew neqabah (female) to note the genitalic sexual distinction. ii. This is discussed in Eden’s Bridge, 5.2 Sacrament: Sacred versus Secular. iii. 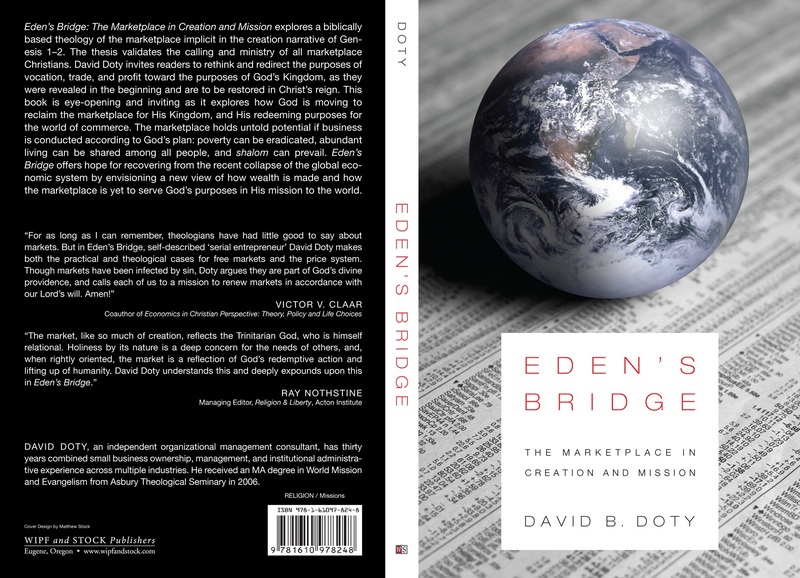 This is discussed in Eden’s Bridge, 4.2 Redefining Business—as mutually beneficial exchange between cooperative laborers to facilitate and enhance relationship. iv. Weal, welfare or well-being, is defined as prosperity, happiness, the general good, and welfare of the community. In effect, true weal is shalom. In the modern sense, wealth (abundant material provision) provides for creature comfort so can be easily understood in the sense of its root, though it can lose its communal character to individualistic greed and material insecurity. v. Such that communalism not be misunderstood outside the context of the whole of Eden’s Bridge, godly communalism is an uncoerced social construct, that is, living with the regard for all willingly out of the character of one’s spiritual nature rather than as a legal condition created by governmental edict. Two statements made at a 2010 summer conference undermine the Christian’s role in the marketplace. Both were made by mature Christian business practitioners and in response to pointed questions after speaking to a largely Christian gathering of theologians, business practitioners, students, clergy, and administrators. The first concerned the role of business in God’s mission in the world (paraphrased): “Business is not ordained of God. It is only a vehicle for doing good.” This would hold true if it were qualified that business is only for the purposes of financial gain. But business serves numerous and far more important purposes. Experience validates that those in agreement with the speaker are generally uncomfortable trying to reconcile the extensive abuses of the marketplace to the character of God. This concern with the “corrupt nature” of the market, therefore it must not be “of God,” is quickly undone if marriage is held to the same purity test. The corruptions of marriage and the marketplace are due to human sinfulness, not God’s design or intent for either institution. An obvious parallel is God’s allowance for the sin of divorce. Jesus addressed the Mosaic divorce decrees as acquiescence to the hardness of the human heart. God hates divorce (Mal 2:16) just as He hates unjust scales (Prov 16:11; Prov 20:10; Prov 20:23) because both are violations of just relationship. Marriage is a covenant, an earthly model of the marriage of Christ and His bride (Eph 5:22–33). The household, as marriage and family, serves as a microcosmic model of the marketplace as a unifying and provisional social community. God’s relationship to humanity is covenantal. God did not destroy humankind when the (pre-Fall) Edenic covenant was broken. Grace remained for human provision and to provide the opportunity for restored relationship with God. In the marketplace, formal contracts are legal covenants but we seldom witness grace (forgiveness) from the world when contracts are broken, further evidence of sin’s corrupting presence. The human social (informal or cultural) contract, as a manifestation of God’s stated moral laws and naturally-ordered law in creation, is fundamentally concerned with economic issues. Law and culturally-based behavioral norms contribute to peace of mind and body and stability to society as they broadly serve the common good. Economics appear to have played a dominant role in God’s indictment and judgment of Sodom, as they did not “help the poor and needy” (Ezek 16:49), and Tyre, where they “did not remember the covenant of brotherhood” (Amos 1:9). The abhorrent acts under indictment were, in the view of God and the godly, clearly unacceptable and violated the shalom of society. Parts of the human social contract and the pursuit of the common good are upheld by law. But God-followers are morally obligated to do good (Isa 1:17; Mic 6:8), delighting in kindness (Hos 6:6), and preserving justice by doing what is right (Isa 56:1; Zeph 2:3), especially for the poor, orphans, widows, the weak, and afflicted (Ps 82:3; Jer 22:3). These are the sacrifices pleasing to God (Heb 13:16; 1 Pet 2:5) which may go beyond the letter of the law, as Jesus often taught. The focus is toward social equilibrium and flourishing, shalom such that all in society are well provided for. God commands His people to do good. Business is one means for doing good and in fact does a great deal of good (i), even as it is carried out by non-believers or operators from other faith traditions. Whenever business is carried out justly, it does good and is God-ordained because we are assured that all good things “come from above” (Jas 1:17). God created the marketplace to serve several positive ends. Human provision, facilitated by the beneficial exchanges of the marketplace, is a fundamental function of creation. Commerce can also be, at least informally, a means of revelatory grace, specifically as immanent charis, the kindness, mercy, and goodwill of God in the world, as business generates wealth that can be used to pay wages, feed the hungry, clothe the naked, and care for widows and orphans. Business can be evangelizing witness to the glory of God as operators share their lives and hope with their employees (by paying fair wages), vendors (by being credit-worthy), customers (by giving excellent service), communities (by supporting and participating in civic activities), and to all by their profession of faith and general congeniality. Christ is present in the marketplace when the devout carry out their business in accordance with God’s will, purposes, and character. The subordination of the marketplace to “worldly” status, as a form of dualism, is an offense to the Scriptures and God. God decreed the cooperative relationship between Adam and Eve and in all its inherently economic, spiritual, social, relational, and ecological nature. We undermine God’s design when we disallow God’s ordination of the marketplace as part of the proper created order. The second comment came when the other businessman referred to his “secular” business. When that description was challenged from the audience, he claimed that the business was “secular but not secularist.” I admit freely that I did not and do not understand what that means. I believe that, like the first speaker, this man views business as not ordained of God and under God’s ownership and operation, but meant that as the operator of the business he has godly intent and aims. I cannot disagree more vehemently with drawing such a distinction. How Christians perceive the division of secular and sacred is important. The popular definition of secular absolutely divides temporal and spiritual matters (dualism). Several Biblical and theological concepts, however, reinterpret that definition. In addition to God’s people, all of creation is being redeemed in Christ, as waiting in earnest expectation (Rom 8:19). Is being redeemed, an active process, is the operative phrase. The functional reality of the Christian life is tension between the worldly (fallen temporal) and the heavenly (restored spiritual). Paul sees this as normal when telling the Corinthians that “we will all be changed” (future passive—1 Cor 15:51–52) and that we “are changed” (present passive—2 Cor 3:18). The first is in reference to the bodily resurrection, the second to taking on the image of Christ. Charles Cranfield, the author of the commentary on Romans published in The International Critical Commentary series, argues that this tension is not resolved between Romans Chapters 7 and 8, but rather that the war between the flesh and spirit is the ongoing conflict of the Christian disciple, striving to serve God in holy living yet recognizing how they continue to fall short of his glory. (ii) Both personally and systemically, the Kingdom of God, the growing reign of Christ in individual hearts and the ongoing redemption of social institutions, is already-but-not-yet, now in imperfect operation yet looking to a future, perfect fulfillment. This moves the discussion toward issues of eschatology, the study of the last thing (eschaton) or last things (eschata). (iii) Mortals peering into the future certainly see “as through a glass darkly” (1 Cor 13:12). The views on what is to come in this world and in heaven run across a broad spectrum. Western orthodox Christian traditions—Roman Catholic, Reformed and the majority of Evangelical—lean toward forms of a post-millennial view that holds Jesus Christ’s earthly reign will occur when He returns (the Second Coming) at the end of a long period of time: a period in which the church is spreading the Gospel throughout the world and leading the transformation of social institutions and cultural norms toward God’s will. These Catholic, Reformed, and Evangelical traditions hold an optimistic view of the future, drawing on Scripture, and the advancement of human institutions in the West, including democratic government and liberalized markets, and the Christian calling to godly ethics in all spheres of life. The validity of these views is defensible in much of the Old Testament prophetic expectations and the New Testament witness, and poignantly expressed by Jesus’ petition in the Lord’s prayer: “Thy Kingdom come, they will be done, on earth as it is in Heaven” (Matt 6:10). Eschatology is fundamentally concerned with God’s reign in the last days in the world, from Jesus’ Ascension until His return. The presence and guidance of the Holy Spirit for the Christian life advocates for a significant degree of Kingdom presence in the world as adherents live in obedience, doing good as the agents of God. Kingdom speaks to ownership and rule as it is under the authority of God’s sovereignty that good works are carried out. Here the discussion shifts to issues of stewardship and sonship. Two strong arguments in Scripture for pursuing the sacred in Christian life are that “the earth is the Lord’s, and all it contains, the world, and those who dwell in it” (Ps 24:1), “and whatever you do in word or deed, do all in the name of the Lord Jesus, giving thanks through Him to God the Father” (Col 3:17). Adam’s appointment as steward (to keep) the Garden was clear. The Bible is filled with considerations of the moral responsibility and character of godly (and ungodly) stewardship. But more than stewards, Christians are the children of God which involves the important elements of inheritance, ownership, and dominion. It is helpful to remember God’s original intention in creation to create a family for Himself, to ultimately bring “many sons to glory” (Heb 2:10). As any good father would, the heavenly Father wants to bestow a rich inheritance on His children, not just of material blessing but, more importantly, of character. Christians anticipate that inheritance explicitly in being called joint heirs of the glory of God with Christ (Rom 8:17) and look to being changed step-by-step, from glory to glory, into the image of Christ (2 Cor 3:18) as the “event” of receiving the inheritance. The nature of the glory of Christ and of the heavenly Father is summed up by the four living creatures in adoration before the throne of God: “Holy, holy, holy.” As God followers, Christians live under the hortatory “Be holy for I am holy” (Lev 11:44b), “like the Holy One who called you, be holy yourselves also in all your behavior, because it is written, ‘You shall be holy, for I am holy’” (1 Pet 1:15–16). The call to holiness presents challenges for Christians in the marketplace, in particular by the phrase “in all your behavior” here and Paul’s “do not be conformed to this world” (Rom 12:2). Holiness (hagios—Strong’s 40) is determinative of character in all aspects of Christian practice. To be holy is to be morally upright by intrinsic or divine character. Holiness is available to Christians only through the power and presence of the Holy Spirit. Christians in the marketplace, feeling pressed by worldly circumstances, may impose an unholy bifurcation on market decisions to allow excuse for ungodly behavior. The nature of holiness has been defined as otherness. God’s glory is so far from our fallen state, for example, that it is understood that we cannot be like God. We cannot be omnipotent, omniscience, or omnipresent. We can, however, seek to know and practice the will of God. Accepting and loving one another, taking on the mind of Christ (Rom 15:5), willingly deferring and sacrificing for one another, submitting ourselves to lives of humble service—these attitudes and acts may challenge the logic of worldly pragmatism (human wisdom) which is limited by the narrow vision of human knowledge. Holiness may oppose what appears to makes sense: “let no man deceive himself. If any man among you thinks that he is wise in this age, let him become foolish that he may become wise. For the wisdom of this world is foolishness before God. For it is written, ‘He is the one who catches the wise in their craftiness’; and again, ‘The Lord knows the reasonings of the wise, that they are useless’” (1 Cor 3:18–20). It easily follows that, beyond any limited righteousness “enforced” by the world’s legal documentation and contracts, businesses operated by Christians are to be held as sacred trusts, set apart for the glory and worship of God. That set apartness means these endeavors are sacramental with a small s, having a sacred nature. Any lesser view relegates the marketplace and the workers’ efforts to the profane. A major influence dividing the spiritual and the secular in Western Christian minds is one hallmark of Platonic dualism: the view that the material world is inherently evil. While creation has been corrupted, this dualism leaves no room for redemption except as an escape from the material realm. This view of the material world encourages false eschatological notions and stands against an already-but-not-yet realization of the Kingdom. Such isolation of secular and sacred even clouds the argument that God’s glory is demonstrated in nature (Ps 19:1). For example, consider the pending birth of a child. Secular humanism wrestles with the essential nature of a fetus (“When does it become a person?”). Yet logic is not troubled that the fetus is present and possesses the potential of a fuller realization. It is at once a thing living though in a transitional state and as yet unfulfilled. Before I was married, I had the potential to be a father (conceptual), but when my wife became pregnant I was in a state of flux until the child’s birth actualized that role. In a real way, I was already-but-not-yet a father during her pregnancy. Compartmentalizing our spiritual and temporal natures is a slippery slope excusing and even justifying the necessity of ungodly policies and practices. Profit, for sustainability and increasing wealth, is ordained of God (Deut 8:18), but that ordination remains only as God is obeyed in both generating wealth (means) and using it appropriately (ends). The primary function of the marketplace in creation is for the facilitation of just relationships toward adequate universal provision, the Edenic shalom as both means and ends. Marketplace Christians are under enormous tension because it is easy to live with just one foot in God’s Kingdom. Compartmentalization is enabling and pragmatism can be self-justifying. Greed and power are strong temptations and compromise easily leads to hypocrisy and dishonors the glory of God. The false divide of sacred and secular presents difficult disciplines and choices for marketplace Christians. That is why personal and systemic economic issues arise in every section of the Bible. In the Torah we find laws and commandments pertaining to the treatment of the poor (Lev 25:35–55) and the valuation of property (Lev 27). In the historic books, we find the military and economic oppression of Israel by Midian (Judg 6:1–10), Boaz leaving gleanings in his field for the poor (Ruth 2:1–9), and the abolishment of usury (Neh 5:1–13). In the wisdom literature, we see that a righteous man does not exact usury (Ps 15:5), that honest scales are of God (Prov 16:11), and that the Lord hears and responds to the cries of the poor (Ps 34:6). And so it goes, throughout the prophets, the Gospels and Acts, the Epistles, and Revelation. Creation is economic by design, and economic justice (equilibrium, shalom) is a primary aim of God’s mission. i. Kennedy, Robert G. “What is the Good That Business Does?,” in The Good That Business Does, 67–85. Grand Rapids, MI: Acton Institute, 2006.
ii. Cranfield, Charles E.B. Romans: A Shorter Commentary, 168–72. Grand Rapids, MI: William B. Eerdmans Publishing Company, 1992.
iii. See Walls, Jerry L., ed. The Oxford Handbook of Eschatology. Oxford: The Oxford University Press, 2008, as an excellent resource for studying eschatology generally. I once heard a seminary professor say something along the lines of “I hope I never find myself extracting principles from the Bible.” I was admittedly shocked and appalled. Was not the Bible the hallmark for establishing Christian principles? Over time, I have reflected on his comment and continued to strive after understanding. I think it finally came as I contemplated 1 Thessalonians 5:17: “pray without ceasing” (NAS). This verse has been one that I have tried to think on since the early days of my Christian walk nearly two decades ago. What does it mean to “pray without ceasing”? As I reflect, I see two ways to embrace Scripture. In one sense, it is a guidebook, a means to know what behavior is acceptable and what is not, hence it creates an opportunity for me to establish a set of guidelines, a moral checklist, so to speak, by which I will know daily if I am a good person, a holy one, or an evil, unholy one. This is a principles-based religion, the essence of the Mosaic Law. The other option is to embrace Scripture as a story revealing God and His character, and me and mine, juxtaposed to each other. It also reveals what God has done to alleviate the shortcomings I find in my own character. Rather than a principles-based understanding, I find myself confronted with a relational understanding of what the Bible is all about. There is a deep philosophic question pertaining to character and behavior as to which precedes the other. Do we act out of behavior or into it? The problem arises in the Western mind by applying an undue bifurcation. Why do we insist that it is a question of Option A or Option B? In truth, we see that character on-display (ethic or behavior) is a product of mindset (belief or morality) and, at the same time, mindset is a product of character (moral determination). And both involve willful choices, choosing both what to believe and what to do. The first, that our mindset determines our behavior is seen in that we base many decisions on what we believe already to be true, especially as concerns moral issues. The story of Jesus teaches us we should be compassionate and since I am a follower of Jesus that is the ethical response to the world I should embody. And from that mindset we tend to practice compassion even sometimes when we do not feel particularly compassionate, or even feel nothing at all. This is a principles-based response. At the same time, we form the character of children, or disciples, by teaching and directing them to think and act in particular ways and, much like practicing the piano, the behavior is learned and improved by practice and correction for misbehaving. Receiving moral instruction begins to establish neural links that are then reinforced or undermined by ongoing behavior and events. At the same time, being fundamentally pragmatic creatures bent on survival and a desire to thrive, we sometimes act, assess the results of our actions, then determine beliefs based on the corresponding relationships between the events. As becomes apparent, the conundrum appears in that we are not always able to discern which came first, the proper order of things, such as the classic chicken and egg paradox. So, how then should we anticipate engaging Scripture? The fundamental issue lies in the heart of our beliefs about the God of the Bible, and the nature of our relationship to Him. Is God disconnected from us, having simply handed down directives to inform our behavior, or is God vibrantly relational, speaking into every situation? The Bible is limited by the reality of being a set number of words and sentences. Some will be put off by that but I ask that they consider we are talking about an infinite God. No number of books could contain all about God nor would our limited human capacity allow us to know and retain all about Him. But let’s put the “pray without ceasing” into another analogy. Psalm 150:6 says “Let everything that has breath praise the Lord.” If we understand that all of creation exists from the impetus of God and that God’s will holds creation in suspension. In a very real way, as we live and breathe we are interacting either within or outside the will of God. As our heart pumps blood through our bodies, we rely on God’s favor to keep it beating. In this sense, we are always connected to or communicating with the reality of God. Hence, by becoming aware of that and practicing a continuing awareness of it, we start to understand how “praying without ceasing” is bringing the core of our being into relationship with God. If I believe that God supplies every breath and ensures each heart thump, and think on it intentionally, I begin to realize that God’s voice, the voice that spoke creation into being and sustains it now, never stops speaking. It is an eternal voice. Whether we are aware of it or not, we are always in contact with the divine. But if we are aware, then we have the opportunity to bring our will into alignment with God’s will. Our “praying without ceasing” gives us opportunity to examine what our appeals to God are saying as we pursue knowing God, as we would any other with which we have relationship. The relational nature of the Bible is meant to help us know God as His character is stated and demonstrated. Knowing His character will help us in learning to hear His voice, to recognize that voice as it speaks through others, through the Bible itself, or as it speaks through circumstances and opportunities. The three persons of the godhead—the Father, Son, and Holy Spirit—are just that: persons. As we look to know God we discover how God acts and responds to us and we measure persons by character. Are they trustworthy? Are they consistent? Are they just? And we respond, we relate, to the character. We do not live our earthly social relationships consciously according to principles lest we miss the subtle nuances of relationships and the importance of give and take within them. We live human relationships according to how we see and anticipate the other parties we engage. If we act only according to principles, we become complex automatons guided by an increasingly complex set of rules. The complexity of the number of circumstances we face through time, given the extent and varied experience of the entire human family, is beyond quantifying. Hence, “principles” must remain fluid for the purposes of adaptability and they tend to lose their fixed-ness as we must adapt to changing social and cultural constructs. The farther we go in life, the more difficult it is to predict how we should or will react in every possible circumstance. In the end, a principles-based approach, whether it be to how we practice business, how we play team sports, or how we relate to our spouses, children, or church families, must become overly legalistic on the one hand if we try to keep it simple enough to manage, or pointless on the other hand if we leave it flexible enough to adapt to every circumstance and it become unmanageable. A major tenet of Christian faith is that we are being “reconstituted,” being transformed and taking on the divine character. As this process occurs, generally labeled sanctification, who we are is redefined, most especially as to how we relate to God, others, and ourselves. Our responses to God, people, and circumstances then should be assessed according to character rather than principle, and we act out of who we are (or desire to become) rather than principles which are, in effect, a catalog of do’s and don’t’s. As the article title intimates, there is an inherent pitfall in trying to approach business (or any endeavor, in fact) with a principles-based mindset. The pitfall is that it puts us in charge of determining what is good and evil, exactly the downfall that led to Adam and Eve being put out of the Garden of Eden. We establish a set of moral tests that determine outcomes but hit a wall when confronted by circumstances that do not fit our model. Our behavior might be assessable by a principled review but trying too much to be led by principles will either not allow us the flexibility to adapt to unforeseen possibilities or our system will be undermined, under constant revision and increasingly fluid, as we realize the rigidity of that approach. As said, trying to “be Christian” is a chicken and egg conundrum. Jesus and the other models of holiness in the Bible show us what holy behaviors looks like and we should set out to emulate them. We will find ourselves unable and frustrated when we fail because, at given points in time, our character has not yet been transformed such that righteousness is as natural as breathing. Principles are a good tool for assessing ourselves and others, inspecting the fruit of our lives as evidence of character. But being in vital relationship with God, praying without ceasing, will guide every circumstance and situation without the burden of Law. I have been a long time fan of the Humane Society, having adopted several pets from shelters throughout my adult life. But I have hit a bit of a snag, not with the Humane Society per se, I do believe in the work they do. The snag comes in how a particular recent event demonstrates the social and economic imbalance of the world in which we live. The Atlanta Humane Society opened its new Mansell Campus recently in the Roswell / Alpharetta area. It is housed in a car dealership building, valued at $6 million, that was donated. An additional $2 million was spent renovating the space. The overall price tag of $8 million is where I hit the snag. I serve on the board of Life Light Ministries (lifelightinc.com), an indigenous Christian mission in Aurangabad, India. They house eighty orphans, operate two Christian schools, and conduct a multitude of outreach ministries including the support of nine pastors and church plants. Last year, Life Light’s entire budget was $100,000. If $8 million can be spent on rescuing and adopting out cats and dogs, how much more could have been accomplished through ministries like Life Light? If $8 million were placed in an endowment for Life Light, it would easily produce $350,000 to $400,000 annually and cover all the operating, capital, and growth needs of the ministry…forever. I am trying to raise funds to travel to India to help Life Light with organizational and staff development. They also have about 30 children right now in need of $35 / month support. I have established a campaign at http://www.indiegogo.com/Indigenous-Indian-Mission-Assistance to raise the immediate travel funds. Would you prayerfully consider supporting Life Light Ministries? All previous post content has been moved to our new website: www.edensbridge.org.